One man who, if anyone does, qualifies for the title of legendary must surely be Dr. Motte. An original through and through, this DJ, producer and remixer from the original vanguard of Technos few pioneering souls initiated and successfully staged what became the biggest cultural celebration of music, tolerance, love and indeed life itself, that the world has ever seen: the Loveparade, which once had a million ravers on the street of Berlin. Even with such achievments to his credit, Dr. Motte has stayed true to his ideals, true to the underground that has been his home for decades. By his chosen way of life, he remains attuned to and a part of that all important zeitgeist. Now like then, he stands for peace, love, unity and respect. Electronic music fans and dancers worldwide are pilgrimaging to Dr. Mottes performances, the cult DJ is building musical bridges uniting people of all ages. Where the doctor spins the records, oldschool ravers and generation z share the same dance floor and all of them enjoy a very special sense of community. Whether on big tours through Australia, India or Japan, internationally acclaimed festivals like the Antaris Project near Berlin, the Why Not? Festival Göterborg (Sweden), the World Club Dome in Frankfurt / Main, at Club Gigs in the Projekt Club Beirut (Lebanon), the Pepper Club in Shenzhen (China) or the Thuishaven (Netherlands). Dr. Motte is preferably invited to events in his prime discipline, the parade: His special performances at huge street festivals such as the City Parade Brussels (Belgium), the Street Parade Zurich (Switzerland) or the Glebe Street Fair Melbourne (Australia) are always highlights. As well as his yearly birthday party at Suicide Circus Berlin. Dr. Motte always invites old and new, national and international guests to the Dr. Motte's Birthday Celebration, such as Ken Ishii, Robert Babicz, DJ T-1000 a.k.a. Alan Oldham, Patrick Chardronnet, Housemeister, Ströme, Dinamite and many more. Unusual locations and extraordinary contexts, this is where Dr. Motte loves to express himself artistically. A dream came true when in early 2018 he was invited by the organisers of the ambient festival Klangsphäre. The audience in the sold-out Zeiss Planetarium Bochum experienced a musical journey through the endless expanses of his musical cosmos, while seated under starry skies. He was drawn from expansive rooms to smaller ones: Dr. Motte is hosting a suite in theHotel Berlin, Berlin for the project You, Me & Berlin, welcoming guests with a collection of private photos and a host letter including his personal recommendations for the stay. So visitors to Berlin can get to know the city from the artist's own personal perspective. The space dedicated to the Techno movement for the exhibition Oh Yeah! 90 Jahre Popkultur – to be seen in the Museum für Kommunikation Berlin from April to September 2018 – was revised by Dr. Motte and his team. For this he provided photographic and other exhibits, such as the original template for the poster of the first Loveparade. For the associated sound station, he recorded a mix on The True Spirit Of The Loveparade. On the occasion of the Lange Nacht der Museen on August 25, 2018 a limited tape will be released and Dr. Motte is going to invite to a rave in the museum's yard. For many years, Dr. Motte has been engaged in charity projects, among them he was a guest DJ at the Live Ball Wien, Laut gegen Nazis, the CSD or the initiator or supporter of initiatives such as FAIRplay – Gemeinsam gegen GEMAinheiten or Fly for Sage for the Sage Hospital e. V. With his longtime partner Ellen Dosch he organized the events Beasts'n'Beats – A Fundraving Party at Berlin clubs Watergate and Salon zur wilden Renate benefitting the local society for the prevention of cruelty to animals Tierschutzverein Berlin e. V. and the Berlin animal shelter. As a musician and a forefather of Rave culture, Dr. Motte is internationally demanded as a speaker and talk guest on panels and events such as Listen! Brussels, theStuttgart Electronic Music Festival SEMF, 24/7 Twenty Four Hours In Our World byResident Advisora s well as at Masterclasses, as in the 3iS Institut International de l'image and du son in Bordeaux, France.The documentary film Sound of Berlin – A Journey Through the Capital of Electronic Music was first shown on May 18, 2018. Together with the founder of the famous club Tresor Dimitri Hegemann, DJ-legends like Juan Atkins, Monolink, Matthias Kaden, Marc Houle and Pan-Pot and many other giants of Berlin club culture, Dr. Motte talked about the special charm of the German capital. Up until 1989 Matthias Roeingh a.k.a. Dr. Motte led a relatively low-key life. 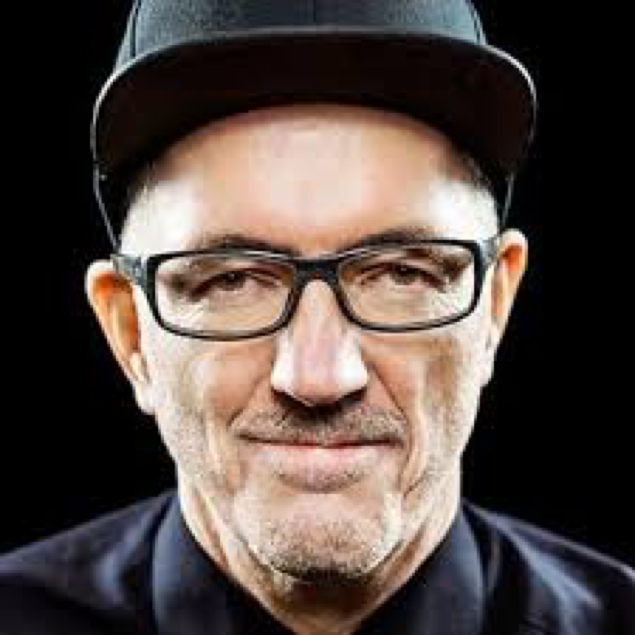 Born in Spandau in 1960 he tiptoed through the scene – from 1981 to 1984 with his band ‘Toten Piloten’ (dead pilots), a Berlin Funk band.In 1985, in search of new musical experiences, the autodidact swapped drums and sticks for vinyls and turntables. In his then club, Turbine Rosenheim, he developed his specific style of mixing at an early stage, for which he drew from a wide repertoire of Jazz, Punk, Funk, Soul, Disco and EBM. Like no other, back then he managed to fuse all these genres. Dr. Motte is a co-founder of cult label Space Teddy Recordings_and in 1992 – for the first time under the name of Dr_.Mottes_ Euphorhythm_– he released his first album Chill_ Out_ Planet_Earth. In the same year another record was released on Tresor_ Records_,_ _that brought the international breakthrough for Berlin Techno and is still considered one of the most important records of the time: 3Phase feat. Dr. Motte –Der Klang der Familie. This successful cooperation was followed by many more, including Robert Babicz, Gabriel Le Mar, Tom Wax, Westbam, Namito, 3 Phase, Johnny Klimek, Paul Browse, Marc Van Linden, DJ Dag and many others. As an explorer on the constant search for new sound, Dr. Motte founded his record label PRAXXIZ_ _in 2010 on which he uncompromisingly presents music reflecting his personal tastes and understanding of high-quality electronic music. The German FAZE_mag_ commented on the Best Of PRAXXIZ_CD compilation:"_With the sounds of modernity PRAXXIZ_ transfers the spirit of the past into the future"
In 2015, Dr. Motte celebrated his 30th DJ anniversary with an international tour using the theme of the first Loveparade: FRIEDE_.FREUDE EIERKUCHEN.// 30 Years Of Dr_.Motte. 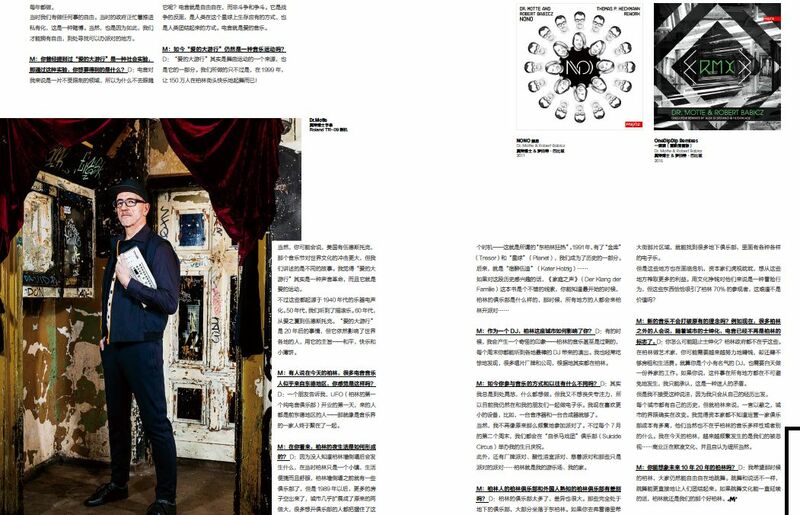 His touring schedule took him to Australia – in cooperation with the Goethe-Institut – China, Italy, India, Poland, Austria, Hungary, the Netherlands and of course Germany. In 1989, before Dr. Motte was successful with his music productions and remixes, he realised an idea that should open a new chapter in music history: A demonstration to represent contemporary culture of electronic dance music called the Loveparade. It was registered as a political demonstration and took place on July 1st 1989, in Berlin. Six weeks earlier, Dr. Motte came up with the idea after friends had told him about illegal raves in England that were busted by the police. But instead of going home, somebody started to play music from a boom box and the people started a spontaneous street party in front of the venue. Dr. Motte was inspired by this and wondered how this spirit could find expression in Berlin, as well. And finally, while also sitting in front of a party venue in Berlin-Kreuzberg, he had the idea to announce a political demonstration. What in the beginning should only have been a “dancing_ _together_ _on_ _the_ _streets_” _soon became political, as the authorities asked for the subject of the demonstration. And so Dr. Motte and the founding team decided to dedicate the demonstration for “Friede_,_ Freude, Eierkuchen" (engl. peace, joy, pancakes):"Peace" for disarmament also interpersonal,"joy" for music and dance as a means of communication and "pancakes" for fair food distribution. 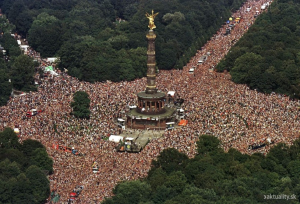 Techno culture became the most important youth movement of the 90s, the Loveparade_its unofficial public holiday. Within ten years, the number of participants rose from 150 to fabulous 1.5 million ravers dancing peacefully on the Straße_ _des_ 17_.Juni. Despite the overwhelming, also commercial success of the parade,Dr. Motte remained true to his clear, musical line and its original spirit. Following the sale of the Loveparade brand in November 2005 and right after the parade in the following summer, he distanced himself publicly for idealistic reasons and those concerning its content.